Kotoko is a custom-made persocom that belongs to the man that kidnapped Chii. 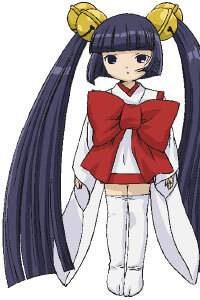 Kotoko, unlike Sumomo, is not hyperactive but rather serious and annoyed easily. Kotoko is one of the first people to confirm that Chii is a Chobit and is rather upset about it at first. Kotoko was programmed to tell the truth, no matter what the circumstance, which got her "abandoned." She also is programmed to do a search when anything out of the ordinary happens. In doing this, Kotoko learns of Chitose's high power lines throughout the apartment and contacts her former Master, who contacts Minoru.